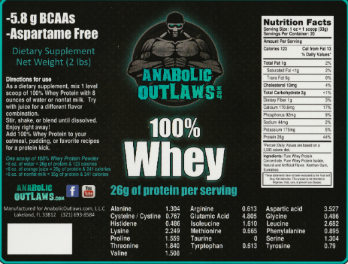 AO Nutrition 100% Whey Chocolate About the product AO 100% Whey delivers 24g of whey protein, has 5.8 grams of naturally occurring BCAAs, and 4 grams of naturally occurring glutamine per serving. Gluten Free. Whey protein shake consumed before or after exercise helps kick start muscle recovery for men and women.